Mill No.1 is a photograph from the series The Last Cooper. This work documents the interior spaces of the now closed Beamish and Crawford brewery in Cork. The title of this project comes from my father who worked here as a cooper (someone who makes wooden casks, bound together with hoops and used for holding beer etc.) The old mill is situated at the very top of the brewery Built by the well-known brewers’ engineering firm of Henry Stopes & Co. of Southwark St. London in 1880 this is one of three mills that Beamish used. Stopes also built kilns and malt houses to their own unique design. I photographed this late at night. This part of the brewery is disused and has no power and working here you are doing so in total darkness. I also did not wish to use flash guns because they have a tendency to flatten the image. I remember trying to focus the lens being a big issue and we had to use a torch to make sure it was correct. 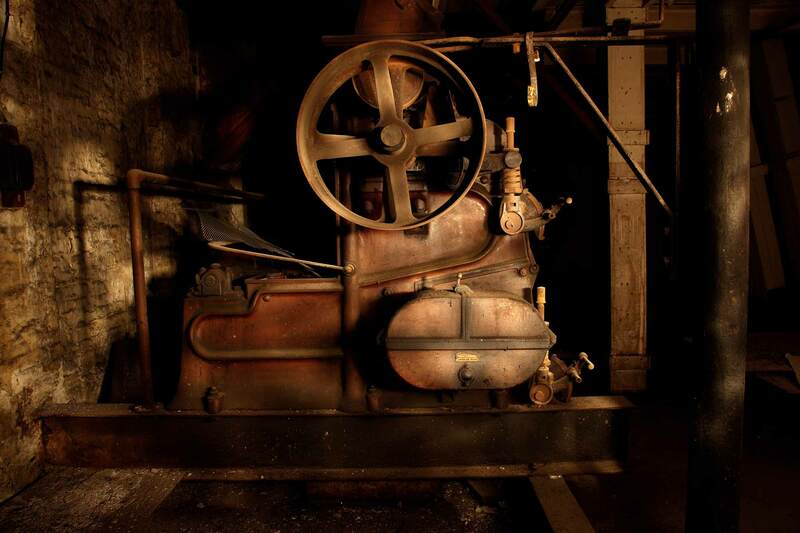 To light the mill for the exposure we used a hand held torch and panned the light over the machinery throughout the long exposure. Working out the exposure was also going to be tricky and there was a bit of trial and error involved. the main problem was to make sure you covered the entire mill with light so it looked even. We started off I think with exposures of six seconds and worked our way up from that. I think this exposure is about 40 seconds. I try to get everything right on location, I’m not one to hold to the philosophy of fixing it it photoshop when if you take your time you can get it right first time. This entry was posted in brewery, cooper, cork, ireland, mill, photography, portraits and tagged art, beamish& crawford, brewery, cooper, cork, ireland, light, mill, photographer, photography, portfolios, the last cooper. Bookmark the permalink.